Starting with a cup of bean broth, with some beans in it as an appetizer or first course, with some of the garnishes. The pork is then served on a separate dish over a bed of black beans and rice. Garnishes that accompany the broth and the main dish consist of slices of lime, sliced radishes, diced onion, cilantro, chiltomate, and sometimes sliced avocado and diced habanero chile. Or, the dish can be served with the rice and beans on the bottom, the pork over the beans, dressed with the broth and then garnishes and chiltomate on top. Some people also like to smash the tender pork meat with a fork and then add the broth and garnishes — this method is referred to in the Mayan language as “puuch,” which in all practicality means to squash or crush. In my house, we’re accustomed to serving it the second way, with a generous helping of broth over the pork so it’s more like a traditional stew. Because of this, you’ll want the beans to be like a soup when they are done. So, if you open the cover when they’re finished cooking and they’re dry, just add more chicken broth, a half cup at a time. I sometimes open the pot halfway through to add more liquids, so they cook down and condense the flavor. You can use chicken broth or water; I think the chicken broth makes for a more flavorful broth. You’ll need a pressure cooker for this recipe. 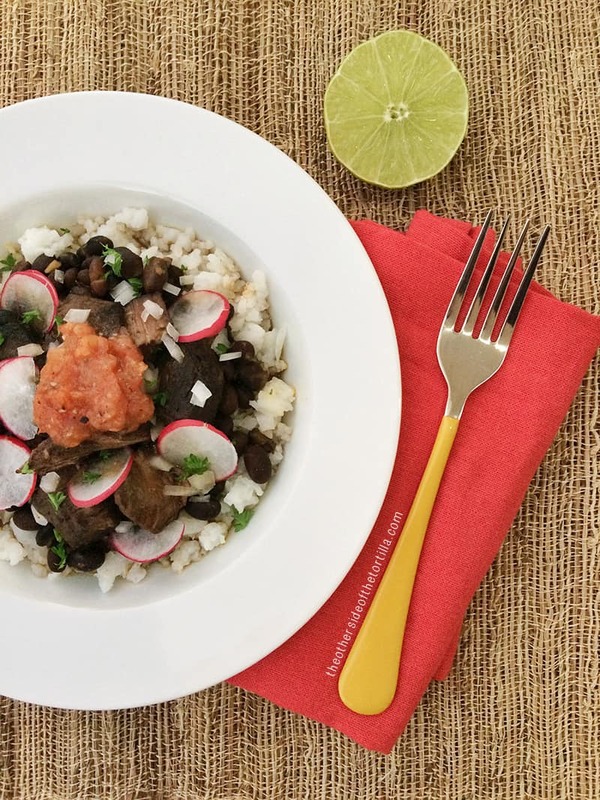 A traditional pork stew from the state of Yucatán, Mexico, served over black beans and rice and accompanied by limes, sliced radishes, cilantro, chopped onion and chiltomate, a habanero chile and tomato salsa. Rinse beans in a colander and remove any broken bean pieces. Be sure to also remove any other debris or small pebbles. Place beans in bottom of pressure cooker pot and arrange meat on top of beans (press the meat into the beans a little). Sprinkle kosher salt over the meat. Place the two onion slices in the pot, one on each side of the meat. Toss the garlic cloves in on top. Cover beans and meat with 5 cups of chicken broth. Close the pressure cooker securely and heat over medium-high heat until the sensor on top starts to rock back and forth. You don't want too much steam to escape or the food inside will get very dry; once the sensor starts to rock, reduce the heat a bit so that it still continues to rock constantly, but doesn’t spin or spit any liquid. Toward the end you will turn the heat to low and the sensor will still rock gently. Cook for about 40 minutes. In the meantime, while the beans and pork are cooking, use a skillet or a comal to roast the habanero chiles until they start to get some brown spots. Cut the roma tomatoes in half and place them cut-side down in a shallow roasting pan. Add the slices of white onion and garlic clove and cook under the broiler for 7-10 minutes or until the tomatoes have dark spots. Remove from broiler and transfer tomatoes, onion, garlic and a half teaspoon of kosher salt to a blender or food processor. Remove stems from roasted habanero chiles and add to the blender or food processor. Pulse until smooth, then set aside in a serving dish. When beans and pork are done cooking, remove from heat. The safety lock takes 5 to 10 minutes to depressurize. Once the safety lock drops, open the pot, using oven mitts and with the lid facing away from you. Add the remaining 2 cups of chicken stock, seal the pot again and cook for another 15-20 minutes until the beans are tender, but not mushy. When finished, there should be enough liquid in the pot to serve like a soup. Serve in shallow soup bowls, first rice on the bottom, then beans, then meat and cover with a bit of the liquid. 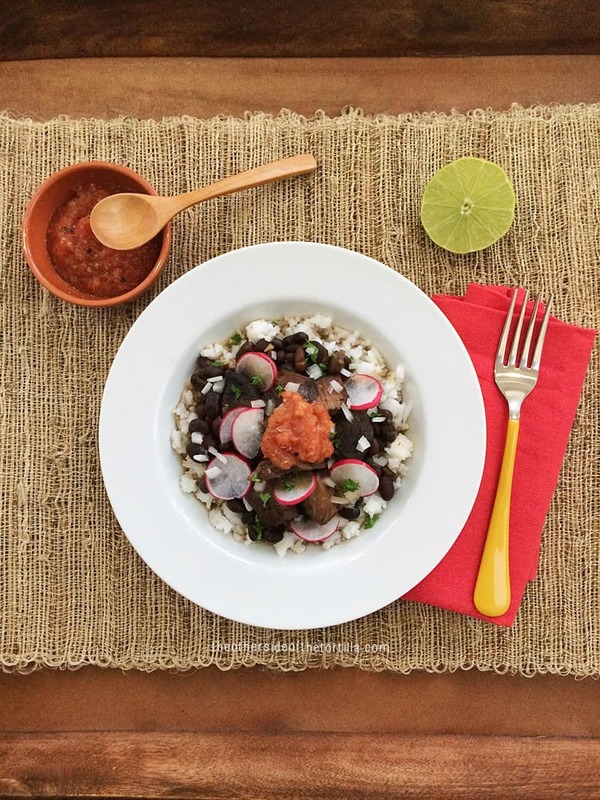 Spoon some of the finely chopped onion, sliced radishes and optional cilantro over the top. Squeeze lime juice over the garnish. Spoon about 2 teaspoons of salsa over the top and stir slightly to distribute, taste to test how spicy it is and add more salsa if desired.